We currently have an attending membership of around 35-40 members, including 10-12 male singers at any one time. Of course we would love to have more singers, particularly younger folk, to keep the broad age range of the choir. Our repertoire is varied and generally there is something to keep everyone happy; from hymns, to popular music, classical to musical theatre songs. At Christmastime the choir usually performs a selection of carols both old and modern. We have given concerts in churches, shopping centres, garden centres, and performed at theatres such as the Whitley Bay Playhouse. Some of our members have performed at the Sage in Gateshead. We were part of a regional competition some years ago in Newcastle upon Tyne, performing alongside professional and amateur groups. 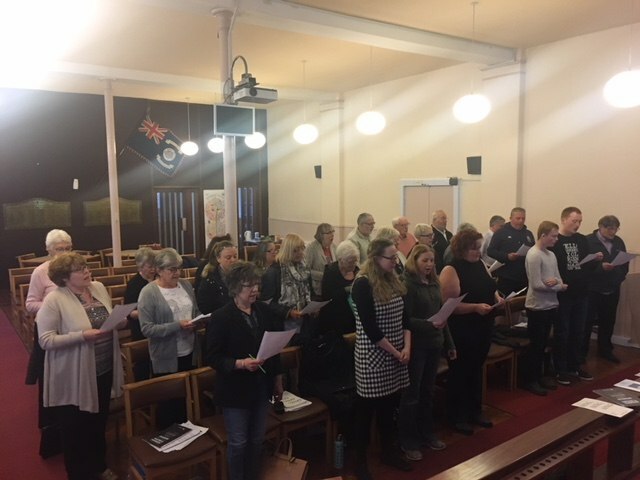 The choir is occasionally joined by other local choirs, young and old, where we have the opportunity to sing in larger groups. We have also been treated to a lesson from a member of the famous Kings Singers. ALTHOUGH WE WOULD LIKE SINGERS OF ALL TYPES TO JOIN, WE WOULD BE VERY PLEASED TO SEE MORE TENORS IN THE CHOIR. IF YOU ARE A TENOR VOICE AND WOULD LIKE TO COME AND SING IN THE CHOIR YOU WOULD BE MOST WELCOME.